Please note, the ACO-40 Depression Remission at 12 months quality measure is not included in public reporting due to low samples. 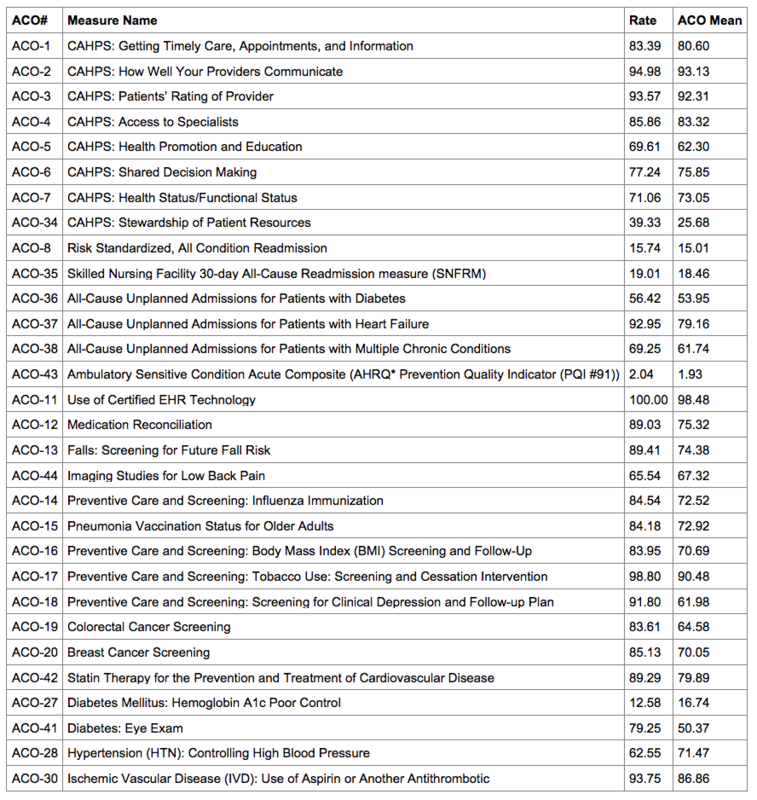 Note: In the Quality Performance Results file(s) above, search for “National Rural ACO 19 LLC” or “Hattiesburg Clinic ACO” to view the quality performance results. This ACO can also be found by using the ACO ID A80689 in the public use files on data.cms.gov. 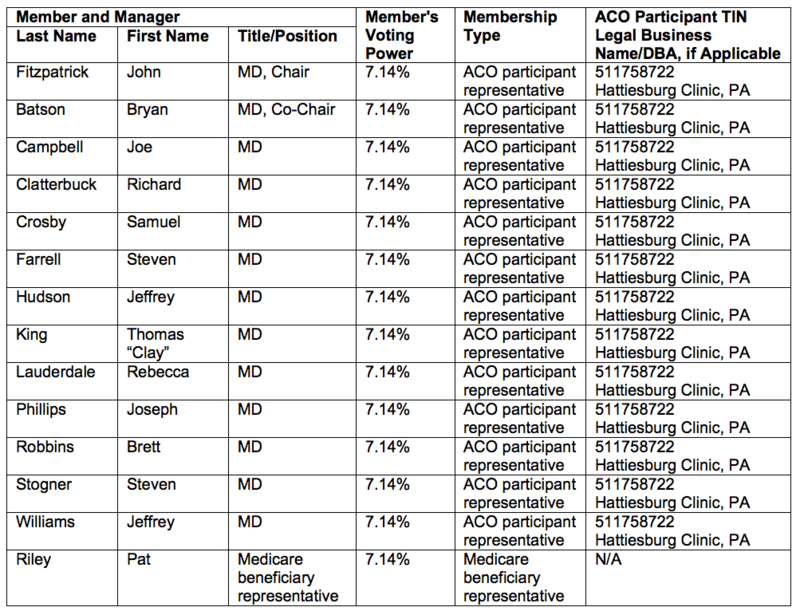 To avail itself of the Pre-Participation Waiver, the Hattiesburg Clinic ACO (the “Hattiesburg ACO”) Board has made a good faith determination that the following arrangements are reasonably related to the purposes of the Medicare Shared Savings Program (“MSSP”), and has undertaken such arrangements with the good faith intention of developing an accountable care organization (“ACO”) that will participate in the MSSP. Hattiesburg ACO is publically disclosing such arrangements in accordance with the requirements of the MSSP and the final rule, published by the Centers for Medicare and Medicaid Services and the Office of Inspector General, that finalizes the waivers of the application of the physician self-referral law, the Federal anti-kickback statue and the civil monetary penalties law provision relating to beneficiary inducements. The Hattiesburg ACO’s Board of Managers (“Board”) has reviewed and approved a certain participation agreement (“Participation Agreement”). The Hattiesburg ACO entered into a Participation Agreement with its participant (“ACO Participant”). Under the Participation Agreement, the Hattiesburg ACO (directly or through one or more vendors) provided to the ACO Participant the overall administrative, management and information technology support and services necessary to apply for participation in the MSSP and the ACO Investment Model (“AIM”), and to operate the ACO, including implementation of evidence-based medical practice and clinical guidelines, promotion of patient engagement, and procedures for managing the quality, safety, and cost of services provided to Medicare beneficiaries, in exchange for the ACO Participant’s participation in the ACO, in-kind services, and the use of AIM funding. The Participation Agreement encourages the ACO Participant to provide certain clinical services to patients in order to promote improved quality of care under various quality assurance initiatives undertaken by the ACO, improve patient satisfaction, and help reduce the cost of providing quality health care, all in furtherance of the purposes of the MSSP. The Participation Agreement provides for a remediation process and describes how shared savings will be distributed. The Participation Agreement was signed prior to the MSSP application deadline. The ACO Participant which is a party to the Participation Agreement is identified on this website. The Hattiesburg ACO, directly, and through Caravan Health f/k/a/ NRACO Services Corporation (“NSC”) and other vendors, engaged in activities related to the formation of the Hattiesburg ACO’s legal entity, the drafting of the corporate documents and Participation Agreement, the development and submission of the Hattiesburg ACO’s applications for participation in the MSSP and the AIM, the recruitment and contracting of the Hattiesburg ACO participants and providers, the development and purchase of a data warehouse and information technology infrastructure, acquiring the staff and infrastructure necessary to successfully participate in the MSSP, and the funding of all of the above activities. The Hattiesburg ACO has entered into a services agreement with NSC, pursuant to which Hattiesburg ACO purchases one or more or the above items and services. This start-up arrangement began May 2015 with the formation of the Hattiesburg ACO limited liability company (“ACO/LLC”). The Hattiesburg ACO/LLC was formed as a Delaware limited liability company. As a part of its formation and organization, the ACO/LLC adopted an operating agreement. The ACO/LLC operating agreement was adopted and signed by the sole member, Hattiesburg Clinic, PA, and by the ACO/LLC. The ACO/LLC operating agreement describes how the ACO/LLC will conduct and govern its affairs. Under the terms of the ACO/LLC operating agreement, the business and affairs of the Hattiesburg ACO shall be managed by the Hattiesburg ACO Board of Managers. The individuals serving on the Hattiesburg ACO Board of Managers are listed on this website. To avail itself of the Participation Waiver, the Hattiesburg ACO Board has made a good faith determination that the following arrangements are reasonably related to the purposes of the MSSP. The Hattiesburg ACO is currently participating in the MSSP as an ACO. Hattiesburg ACO is publically disclosing such arrangements in accordance with the requirements of the MSSP and the final rule, published by the Centers for Medicare and Medicaid Services and the Office of Inspector General, that finalizes the waivers of the application of the physician self-referral law, the Federal anti-kickback statue and the civil monetary penalties law provision relating to beneficiary inducements. The Hattiesburg ACO, directly, or through NSC and other vendors, engages in activities related to the drafting of corporate documents and the Participation Agreement, the recruitment and contracting of the Hattiesburg ACO participants and providers, the purchase and implementation of a data warehouse and information technology infrastructure, acquiring the staff and infrastructure necessary to successfully participate in the MSSP, and the funding of all of the above activities. The Hattiesburg ACO has entered into a services agreement with NSC, pursuant to which Hattiesburg ACO purchases one or more or the above items and services. The services agreement between Hattiesburg ACO and NSC was in effect on or before January 1, 2016. The Hattiesburg ACO entered into a Participation Agreement with its ACO Participant. Under the Participation Agreement, the Hattiesburg ACO (directly or through NSC and other vendors), provides to the ACO Participant the overall administrative, management and information technology support and services necessary to operate the ACO and participate in the MSSP and AIM, including implementation of evidence-based medical practice and clinical guidelines, promotion of patient engagement, and procedures for managing the quality, safety, and cost of services provided to Medicare beneficiaries, in exchange for the ACO Participant’s participation in the ACO, in-kind services, and the use of AIM funding. 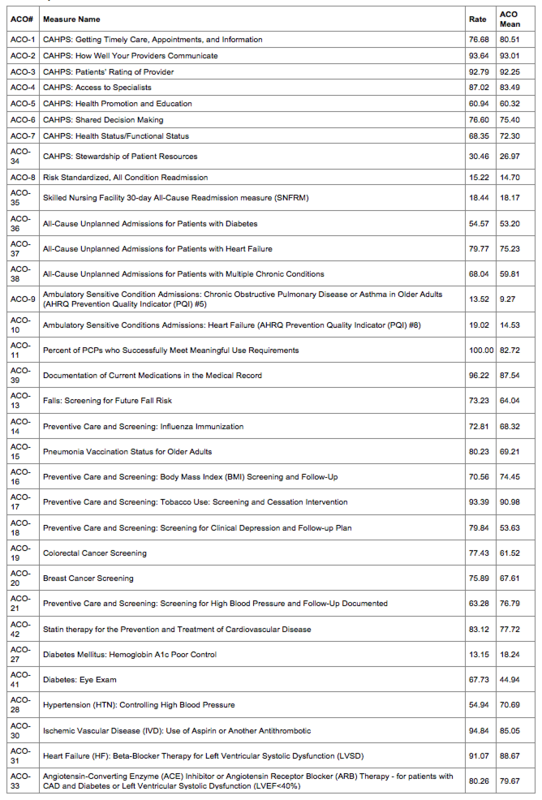 The Participation Agreement encourages ACO Participants to provide certain clinical services to patients in order to promote improved quality of care under various quality assurance initiatives undertaken by the ACO, improve patient satisfaction, and help reduce the cost of providing quality health care, all in furtherance of the purposes of the MSSP. The Participation Agreement provides for a remediation process and describes how shared savings will be distributed. The ACO Participants who are parties to the Participation Agreement are identified on this website. The Participation Agreement was signed prior to the MSSP application deadline. The Hattiesburg ACO/LLC was formed as a Delaware limited liability company. As a part of its formation and organization, the ACO/LLC adopted an operating agreement. The ACO/LLC operating agreement was adopted and signed by the sole member, Hattiesburg Clinic, PA, and by the ACO/LLC. The ACO/LLC operating agreement describes how the ACO/LLC will conduct and govern its affairs. Under the terms of the ACO/LLC operating agreement, the business and affairs of the Hattiesburg ACO shall be managed by the Hattiesburg ACO Board of Managers. The individuals serving on the Hattiesburg ACO Board of Managers are listed on this website. To avail itself of the Participation Waiver, the Hattiesburg ACO Board has made a good faith determination that the following arrangements are reasonably related to the purposes of the MSSP and is publically disclosing such arrangements in accordance with the requirements of the MSSP and the final rule, published by the Centers for Medicare and Medicaid Services and the Office of Inspector General, that finalizes the waivers of the application of the physician self-referral law, the Federal anti-kickback statue and the civil monetary penalties law provision relating to beneficiary inducements. The Hattiesburg ACO is currently participating in the MSSP as an ACO. In connection with its ACO activities, Hattiesburg ACO or its ACO participant (as identified on this website) including such participant’s providers, will provide to patients, free or below fair market value, medical equipment that the Hattiesburg ACO or ACO participant or provider reasonably determines is necessary or useful for the patient to fully engage in preventive care, or to adhere to his/her treatment, drug or follow-up care regimes or to manage his/her chronic disease or condition. This arrangement was approved by the board of the Hattiesburg ACO on February 18, 2016. The Hattiesburg ACO is currently participating in the MSSP as an ACO. In connection with its ACO activities, Hattiesburg ACO or its ACO participant (as identified on this website) including such participant’s providers, will provide to patients, (i) free or discounted (including, below fair market value) delivery of medications; or (ii) free medications to patients with demonstrated financial need. The provision of (i) free or discounted (including, below fair market value) delivery of medications, and of (ii) free medications to patients with demonstrated financial need, by the Hattiesburg ACO, or by a Hattiesburg ACO participant or provider, is necessary or useful for the patient to fully engage in preventive care, or to adhere to his/her treatment, drug or follow-up care regimes or to manage his/her chronic disease or condition. This arrangement was approved by the board of the Hattiesburg ACO on February 18, 2016. The Hattiesburg ACO is currently participating in the MSSP as an ACO. In connection with its ACO activities, Hattiesburg ACO or its ACO participant (as identified on this website) including such participant’s providers, will provide to patients affordable transportation options, which includes the provision of shuttle services or a coupon or voucher that patients can use to purchase transportation services from a transportation vendor, in order to ensure patients are able to keep appointments with primary care providers, and obtain necessary medications and other necessary medical services all of which advance one or more of the following clinical goals: (a) adherence to a treatment regime; (b) adherence to a drug regime; (c) adherence to a follow-up care plan; or (d) management of a chronic disease or condition. This arrangement was approved by the board of the Hattiesburg ACO on February 18, 2016. For general questions or additional information about Accountable Care Organizations, please visit www.medicare.gov/acos.html or call 1-800-MEDICARE (1-800-633-4227) TTY users should call 1-877-486-2048.